I enjoy being in Makati, as there's always something new to see and to discover in the city. And if there's a destination in the metro that's worth staying in, it's definitely this area. I actually spent the weekend in the urban jungle for an early Christmas gathering with friends; and fortunately found a home away from home at aurumOne Makati -- a boutique hotel located in Evangelista Street. My friends and I checked-in at the hotel around 3 PM, so were obviously running late since we each had to finish some last minute errands at Glorietta Mall. But as soon as we were done, we got on our booked GrabCar, and were soon dropped off at the hotel in less than 10 minutes. We were greeted courteously by the security guard upon entering the lobby, and were welcomed with smiles at the reception. Check-in was even smooth and fast, as I only had to sign a form and present an ID. And as soon as things were settled, I was given the key card and was instructed to check into our room on the 3rd floor. I was completely surprised as to how big our lodging was, as our spacious Aurum Premiere room could definitely fit 3 pax (two on the bed and one on the couch). The room itself is a one-bedroom suite that includes a kitchenette and dining area. It's also equipped with full dining amenities, and one queen size bed. It definitely had that 'wow' factor, so I was pretty impressed. Two of my friends, Jherson and Claire, enjoyed the small dining area in the room, which they used to hold their "meeting". They savored the cool blast of the A/C, and stayed connected via the hotel's fast Wi-Fi, while they plotted their international trip for next year. I, on the other hand, managed to get some rest by the couch, while I waited for my gadgets to fully charge. Electrical outlets, by the way, were plenty in our Aurum Premiere space, so charging all of our devices wasn't a problem. I commend accommodations that offer PWD-friendly rooms, as our Aurum Premiere had access to one. The room itself has two bathrooms: (1) one in the bedroom, (2) and one by the living room. I definitely took notice of the differences of both restrooms, and instantly saw how the one by the living room addressed accessibility. The PWD-friendly bathroom had metal grab bars attached on the walls (one by the toilet, and another one by the shower). So it was good to see a hotel that offered this in their spaces, as they definitely had in mind the needs of their handicapped guests. I also liked the fact the free toiletries were provided. Even towels were plenty (good for 4 pax), as well as extra pillows for use. There was also an electronic safe in the cabinet, which I used to keep my gadgets in place. The room also had its own kitchenette complete with a sink, Microwave oven, Water heater, Refrigerator, and a drawer full of plates, glasses and utensils. I also love how spacious the living room was, and how comfy the spring couch was. Even the grey fabric used on the sofa complemented the entire look of the room. My friends and I slept real late. As soon as we came home from our dinner. We just watched TV and munched on some late snacks, which we purchased at a nearby Family Mart. The 24/7 convenience store can be easily accessed directly from the hotel lobby. I slept earlier (3 am) than my two other friends, so I was able to sleep for about 6 hours. I just woke up to the sound of the phone ringing, and thought that it might be a courtesy call of our impending check out. But my friend came into the room to inform me that our complimentary breakfast meals will be delivered to our room instead. I was pretty elated that aurumOne allowed this option, especially for guests like us who wanted to just stay in until it was time for us to check-out. Breakfast is usually served from 6 to 9 AM at the 8th floor. But since we still lacked in sleep and was too lazy to get up and eat, we just requested for our food to be taken to our room. It wasn't long until two ladies rang the doorbell with our Oriental and American meals in tow. The bed was simply divine, as it gave me a restful sleep (even if it was just for a few hours). The A/C in the room was quite cool, but the bed covers definitely kept me warm throughout the night. Believe me, it was just what I needed -- a bed to crash into after a long night in Makati with friends. Going back and forth the hotel isn't difficult, as public transportation is quite accessible in the area (you can ride a Baclaran bound bus in EDSA and tell the conductor to drop you off at Jollibee by Evangelista Street). While we traveled via Grabcar and Uber most times, we were also able to ride the jeep after check-out. Since my friend and I were heading to Quezon City, we rode the jeep that was bound for Libertad LRT (going to Roosevelt). You'll find this jeep plying Evangelista Street. I would definitely stay at aurumOne again. 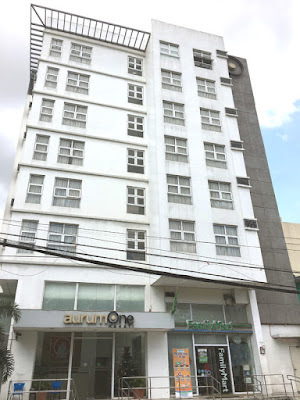 It has one of the most ideal locations, as the hotel is perfectly situated near Manila's airports, Makati's CBD, Mall of Asia and other notable landmarks. It truly is the "hotel of choice by value-conscious businessmen, professionals and leisure travelers." Note: This is a sponsored stay with aurumOne Makati. (Budget Biyahera) I do not represent the thoughts, intentions, plans or strategies of the establishment or its owners. All views and opinions shared on this website are solely my own. 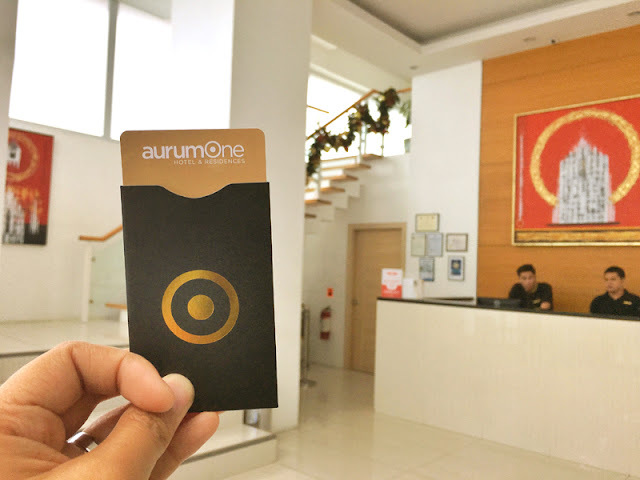 The use of this 360° virtual tour of Aurum One Hotel is authorized by Traveloka.